This is the be-all, end-all, perfect summer dinner recipe. Served on the beaches of Brazil (with an ice cold beer or chilled baby coconut alongside, of course! 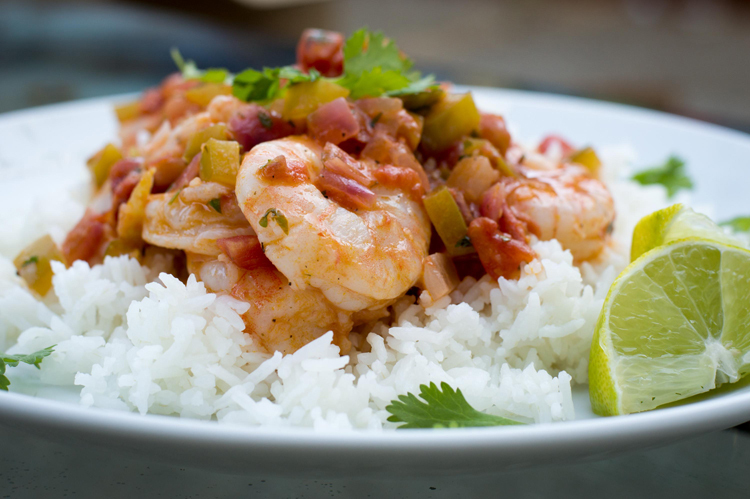 ), Moqueca de Camaro is a quick-cooking stew of shrimp simmered in a spicy coconut and tomato sauce. The roasted flavors of Garlic Gold® Oil and Sea Salt Nuggets lend savory background notes to the sauce, and tangy lime juice and fresh cilantro give it brightness and kick. This well-balanced, restaurant-quality dish is perfect for family dinners and dinner party entertaining alike! Cook a fluffy pot of long-grain rice while you’re preparing the stew, and the whole meal will be ready all at once. In a medium mixing bowl, toss the shrimp with the black pepper, Garlic Gold® Sea Salt Nuggets, and lime juice. Set aside. 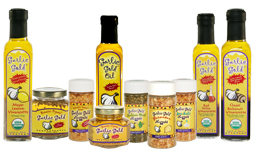 In a large (12-inch) stainless steel or cast-iron skillet, heat the Garlic Gold® Oil over medium heat. Add the onion and bell pepper and sauté until softened but not browned, about 6-8 minutes. Add the red pepper flakes and sauté for another minute. Add the tomatoes to the skillet. Simmer until no more liquid remains, but the ingredients are not beginning to brown or stick to the pan, about 7 minutes. Add the coconut milk to the skillet, stirring to combine. When it has come up to a simmer, add the shrimp mixture and cook, stirring often, just until the shrimp are cooked through, 3-5 minutes. Remove the skillet from heat, then stir in the (optional) red palm oil or Garlic Gold® Oil and cilantro. Serve hot over steamed rice. For a low sodium variation, substitute Garlic Gold® Original Nuggets for the Sea Salt Nuggets, and substitute no-salt-added diced tomatoes and a 1/2 teaspoon of smoked paprika for the fire-roasted tomatoes. Feel free to vary the heat in this dish by adding more red pepper flakes, or leaving them out if you prefer. Red palm oil, a.k.a. dendê oil, can be difficult to track down, especially an organic, sustainably-harvested variety! We like the one from Nutiva, which you can find here: https://store.nutiva.com/red-palm-oil/.